Take a tour of the most amazing landmarks and cities in Florida! God Bless Florida will show readers how special their state is and how God made such a wonderful place for us to live. 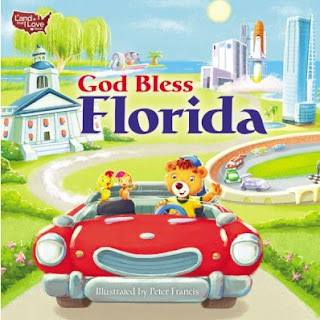 God Bless Florida by Peter Francis is a wonderful book for kids! The illustrations throughout the book are beautiful and extremely colorful and do an amazing job at entertaining kids. I love that God Bless Florida by Peter Francis is education but fun. My kids love reading this because we know a few people in Florida so now they know a bit about their state. God Bless Florida by Peter Francis is a very fun book and I also love how at the end of the book the credit for the beautiful state of Florida and everything that it has to offer is given to God! Awesomely cute book!